The timing of my formal college education can be a little confusing, and some public information seems contradictory. Here, I will try to set the record straight. One general complication is that at George Mason University (GMU), if you complete the degree requirements in December, it takes time for them to confirm this, so the degree is not formally granted until January in the following year. As a result, there are two validly-different years that can be cited for all my degrees. Even more confusingly, GMU only had ceremonies at the end of the Spring semester at this time. That means that, for all my degrees, I completed the work in one year, offically received the degree in January the next year, and had a ceremony in the May timeframe. My PhD process was a little unusual, and I unintentionally gave wrong dates when asked about them during my PhD public defense (I swapped ending dates and starting dates). That added even more confusion to a confusing situation, sorry. 1983, Fall: Began college at George Mason University (GMU), Fairfax, VA. I first started in Computer Science, but was bored (I already knew a lot of it) so I switched to Electronics Engineering. 1987, December: Completed requirements for a BS in Electronics Engineering (EE). Since those who complete requirements in December at GMU don’t actually receive the degree until the following month, my BS in EE was not formally granted until January 16, 1988. I graduated with distinction. 1989, Fall: I began my pursuing a Master’s in Computer Science program at GMU. 1993, December: Completed the requirements for an MS in Computer Science (CS) from GMU, as well as a Certificate for Software Systems Engineering, GMU. My MS in CS was formally granted on January 15, 1994. 1994, Summer: Attended the class “Design and Analysis of Distributed Protocols”, Summer Session, Massachusetts Institute of Technology (MIT). 1995, Fall: I began pursuing a PhD at GMU. 2005: I wrote, and ACSAC published, my paper "Countering Trusting Trust through Diverse Double-Compiling (DDC)" (this summarized my work to that point). My paper was one of the few papers ACSAC accepted (ACSAC rejected 77% of their submitted papers that year), so merely getting accepted for publication was an honor. I submitted the paper on 2005-05-27, later submitting a revised version (based on their peer review) on 2005-09-22. It was published as part of the ACSAC proceedings of December 5-9, 2005. Bruce Schneier's January 23, 2006 edition of his Crypto-Gram Newsletter covered the ACSAC paper and was very positive. 2007-04-27: Proposal presentation and admission to (PhD) candidacy. 2008-12-31, 10pm: Successfully applied DDC to gcc's C compiler. 2009-10-26: Doctoral Research Presentation (to my committee) and Doctoral Supervisory Committee approval for (public) defense. 2009-11-09: Formal submission of draft PhD dissertation for public review. 2009-11-23: Public defense of PhD dissertation. 2009-11-30: Final version of the dissertation (with tweaks) submitted GMU's Fenwick library. 2009-12-02: Completed the requirements for a PhD in Information Technology; this is when I got all required approval signatures. So I finished the PhD more than 14 years after I started, but to be fair, I was also working full-time and tackling a problem that had generally been considered unsolvable. 2010-01-09: PhD in Information Technology formally granted to me. 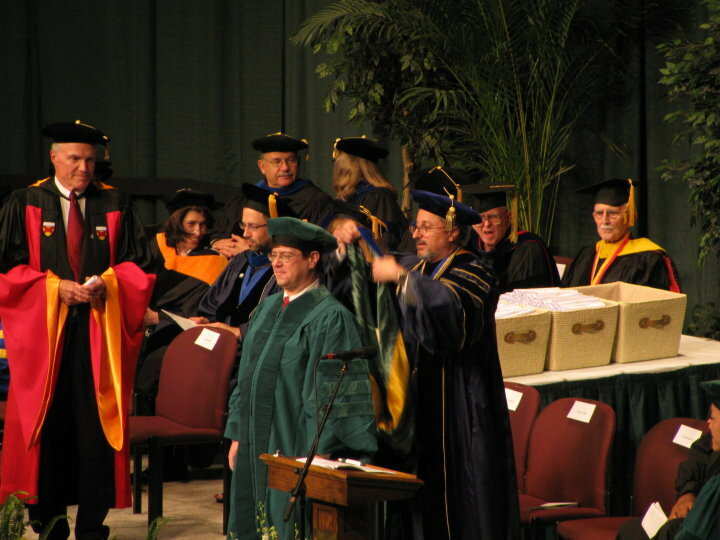 2010-05-15: Participated in the official 2010 GMU commencement. Technically it took about 14 and a half years to get my PhD (Fall of 1995 through January 2010). That is certainly not the longest, for example, a Peter Miller took 40 years to receive his History of Consciousness Program Ph.D. from University of California Santa Cruz (UCSC) (he entered 1971, and graduated 2011). Feel free to see my home page at https://dwheeler.com. My page on the trusting trust attack may be of interest. You may also want to look at my paper Why OSS/FS? Look at the Numbers! and my book on how to develop secure programs. (C) Copyright 2012 David A. Wheeler.